Cunninghamia lanceolata ‘Glauca’ to be found in the Pinetum towards the fountain. 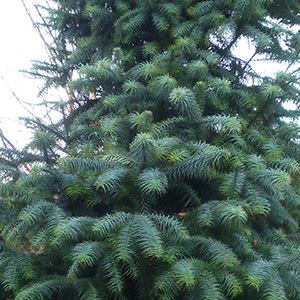 This little grown conifer is hardy but requires a sheltered position away from drying winds which will desiccate the conifer’s older needles, turning them brown and persistent leaving a messy looking tree. Our tree has been cut back by various problems, such as squirrels damaging the original leader, but is quite happy forming a multi-stemmed tree. If you want a specimen tree, pick one stem from the new growth to form a new leader and remove the other shoots. Personally, we like our very exuberant growth. The incredibly lush foliage, very similar to a Monkey Puzzle tree but no relation, is a wonderful blue colour.